In the 17th and 18th centuries Rome was the heart of the Catholic Church and the capital of the Papal State, and was a city whose social, political and economic relations were dominated by around twenty prominent aristocratic families. Historians of the performing arts have generally focused their studies on the role of artists associated with the Papal Court and institutions such as churches and public theatres. However, the theatrical, musical and choreographic events organised by aristocratic families in their residences both in the city and in the country were one of the most significant aspects of the social life of these elites, as well as a calculated means of affirming their political leanings. The PerformArt project will adopt a comprehensive multidisciplinary approach. It draws systematically on the archives of the principal aristocratic families in Rome in order to offer a contribution to the history of performing arts in the city through a deeper understanding of the role of artists in the daily life of the nobility, clarifying the conditions and motivations of their patronage. This perspective will enrich our understanding of the processes generating artistic creativity. We shall uncover writings and scores which have long fallen into oblivion as they represent a historical period which is somewhat neglected in Italy; thus we will be able to incorporate newly-found knowledge into our cultural heritage. Finally, this will lead to an updated perspective of our current image of performing artists and their status, shedding a new light on their mobility, on their means of developing their careers and on the interaction between dependence on a single patron and freelance work within a specific social, economic and political system. The examined historical period begins in 1644, the year of ascent to the Papal throne of Pope Innocent X of the Pamphilj family, and ends in 1740, with the death of the cardinal and patron Pietro Ottoboni, which marks the end of the age of nepotism. Our understanding of the performing arts in the aristocratic milieu in Rome is currently compromised by some factors. Firstly, the history of performing arts in Italy is a very inhomogeneous research field, as it varies greatly depending on the city which is taken into consideration. While some cities such as Florence, for example, have benefited from a long tradition of theatre studies, in the case of Rome research tends to be entirely focused on staged productions, and especially on modern theatre. Secondly, the archives of the noble families in Rome have tended to be used as a source drawn upon in order to confirm some thesis or other. However, only a global approach can prevent the unavoidable distortion inferred by each partial description of the society in question. Another cause lies in the fact that the majority of specialists has opted for research focused around predominant historical figures. Regardless of the brilliance of these studies, a similar choice would inevitably involve an oversimplified and imperfect perspective of the artistic world in Rome at the time. We can still confirm that there are no global studies to date dedicated to musical and theatrical patronage in Rome, nor any academic studies on the Baroque Era in Rome encompassing musicians, actors and dancers at the same time. Musicologists are mainly focused on confraternite, churches, collegi, on the phenomenon of patronage and on studies of musical genres such as sacred and secular vocal music, opera, oratorio and its origins or the concerto grosso. Theatrical research is focused on questions of performance and staging. Although some initial study on the subject of choreographic studies has prepared the field and laid out foundations for future enquiry, research on dance in Rome during the 17th and 18th centuries is still in its infancy. Finally, the Papal Court has monopolised the attention of researchers at the expense of other courts. However, as the heart of Christianity and the fulcrum of international diplomacy, Rome was a highly poly-centric city: the courts of princes and cardinals formed groups with opposing interests, offering space for freedom and creativity. 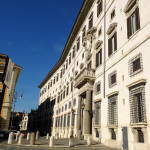 Although some princely courts in Rome have been studied individually, so far nobody has attempted to compare them. To ensure that the research proves fruitful, it had appeared necessary to extend our study to a significant number of families. 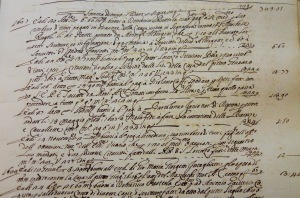 The PerformArt project will systematically describe documents concerning the years 1644-1740 contained in eleven family archives in Rome, Frascati, and Subiaco. This should reveal sufficient material to profoundly renew the study of performing arts in the milieu formed by these families of the Roman aristocracy. The PerformArt team will use secondary sources to collect all information concerning the performance activities within the eleven families examined. Once included in the database, this information will form the basis of a common understanding for the team which will be complemented by a permanent bibliography which is to be constantly updated. In order to make use of these archives in a systematic manner it is necessary to understand the principles underpinning the classification of the documents. For this reason researchers will necessarily be required to collaborate with archivists, who are specialised interpreters of the rationale behind our archival heritage. The documents which will prove to be pertinent to the study of the performing arts will be transcribed in full. One of the difficulties of the project lies in the fact that the family archives rarely constitute isolated collections: they often contain documents relating to other families, owing essentially to the kinship ties created through intermarriage. Untangling the web of these codependent and interconnected spheres represents a challenge, but it is also one of the added benefits of the PerformArt project. A “close reading” of all data is the prerequisite for a subsequent “distanced reading”. It is not sufficient to unearth a proof of payment made by a patron to a musician or a list of actors; it is imperative to contextualise this type of information through cross-analysis of documents contained in the family archives. These will often be supplemented by consulting external sources such as notices not kept within the family archives, notarial documents, embassy archives in Rome, scores, libretti, and literary sources.